Pascal Wehrlein raced his way into the DTM series, participating in the German manufacturer category for two years. He linked up with the Mercedes F1 team for a test driver role at the end of 2014, participating in a post-season test in Abu Dhabi, and the following pre-season testing in Spain where he drove for both Force India and Mercedes. Ahead of the 2016 season he was hired by Manor Racing for a full time race drive and switched to Sauber for 2017. Wehrlein began his racing career in Germany, working through the many karting series and championships until he could make the step up to cars. He participated in the national ADAC Formel Masters series for a couple of seasons, winning the title at his second attempt. 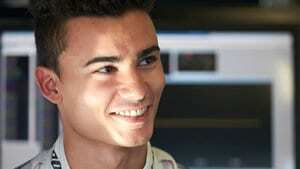 In 2012, Wehrlein finished second in the championship for the Formula 3 Euro Series, racing for Mücke Motorsport. The following season he moved to the DTM series driving for the same team. He picked up a couple of points in his first series, and moved to the HWA team for 2013. Pascal won his first DTM race that year, finishing the season eighth in the standings. The link with Mercedes was confirmed with a test driver role for the F1 team, announced towards the end of the 2014 season. He participated in the post-season two day test at Abu Dhabi, setting the fastest lap in the fastest car. He was also drafted in to the pre-season test in 2015, driving for both Mercedes and Force India in Barcelona. Initially loaned out to the Force India team, Wehrlein had to be drafted back into the Mercedes on the first day of testing to deputise an unwell Lewis Hamilton. As part of Manor Racing's power unit supply deal with Mercedes, Pascal Wehrlein was granted a full time race drive for the 2016 season with the team, who also gained access to the wind tunnel at Brackley. He was partnered by Rio Haryanto as Manor fielded another double rookie team for 2016. Midway through the year, however, Rio was replaced by Esteban Ocon and Wehrlein suddenly found himself with a bit of competition in the other car. He was outshone by the French driver, and was overlooked for a drive with Force India for 2017 in favour of Ocon. His name was briefly in the frame for the seat at Mercedes when Nico Rosberg suddenly retired, but the top team were apparently concerned about his lack of experience. With the future of Manor looking bleak, Wehrlein earned a spot at the Sauber team, joining the Swiss squad for the 2017 season. Pascal Wehrlein has come back into the pits again, and Sauber are retiring the car. Pascal Wehrlein has pitted, he was already running towards the back anyway. The top nine drivers are all starting on purple/pink ultrasofts. Massa, Ericsson, Stroll, Verstappen, Magnussen and Vandoorne are on the red supersets, whilst Pascal Wehrlein is the only driver to start the race on the yellow softs. Team radio from Pascal Wehrlein: "Can I pass Marcus? ""If you're quicker, yes of course." In terms of tyres, almost all of the grid are on the ultrasoft tyres. The top ten on used purple stripes as well. Only Kevin Magnussen in 18th and Pascal Wehrlein from the pit lane are on the supersofts. Pascal Wehrlein crashed during qualifying and has a gearbox change penalty but won't have to take it as he is also required to start from the pit lane.